The Hindu Group’s Empower All India Test Series For JEE Main And NEET: The Hindu Group, one of the most reputed publications in India, in collaboration with Embibe has scheduled two online all India mock tests for each of JEE Main and NEET. This is a great opportunity for JEE Main and NEET aspirants to know where exactly they are standing among students from all over the country. What makes this all India test series unique is its real-time feedback and test-to-test improvement report along with guidelines on how to improve your score. Many of the engineering aspirants who are appearing for the ongoing January session of JEE Main 2019 are planning to appear for the JEE Main April session as well so as to improve their scores. Medical aspirants too, who are appearing for NEET 2019, need to pull up their socks. They must prepare for the exam in the most efficient manner, especially, because unlike JEE Main, NEET 2019 will be conducted only once. It is, therefore, important at this point to take mock tests and evaluate your level of preparation. JEE Main and NEET are national-level exams wherein students from all over the country appear. Lakhs of candidates appear for these exams every year for a small number of seats which makes the exams highly competitive. Students, therefore, must take All India Test Series for the respective exams. They need to know where exactly they are lagging behind and then, improve on these aspects before appearing for the actual exam. It is for this purpose we bring you the Hindu Empower Mock Test Series for JEE Main and NEET to help you ace your exam and reach your dream college. The Hindu Empower Mock Test Series is a national-level, i.e. All India Test Series for JEE and NEET conducted by The Hindu Group in association with Embibe. Taking the all India test series for JEE Main and all India test series for NEET is crucial to one’s preparation as it will give insights into where the aspirant is standing among lakhs of other aspirants across the country. This, in turn, will give students an idea about whether or not they are going to crack the exam and get into their desired college. They will also get to know the exact factors hurting their score and they can rectify them before appearing for the actual exam. The Empower Test Series will have two tests for each entrance test, which will be conducted at a gap of 3 months between them. This means the All India Test Series for JEE Main will have two tests which will be at a gap of three months between them. Likewise, the All India Test Series for NEET will have two tests. So, students will get time to work on their mistakes and weaknesses as revealed in the first test. After the second test, they can compare their performance/improvement between Test 1 and Test 2. After each test, students will get real-time feedback on their performance, pinpointing their academic weaknesses (like chapters and concepts they are weak at) and gaps in their test-taking strategy (like time management and question selection skills). They will also get guidelines on how to improve their scores. 1. Test Series Vetted By IITians: The Empower Test Series have been vetted by an advisory panel of IITians. 2. Same User Interface: The All India Test Series For JEE Main and NEET has the same user interface as the real exams. So, this will help students get used to the computer-based test platform. 3. Same Exam Pattern: The test series have been designed keeping in mind the latest exam pattern for JEE Main and NEET. 4. All India Rank: Since the tests are conducted on an all India basis, you will get to know your All India Rank. You will also know your State-level rank. 5. Real-Time Personalized Report: The All India Test Series will provide detailed analysis and insights into how you have taken your test. It will point out your areas of improvement, both academically and skill-wise. The analysis of your test will be extremely helpful to improve your score. 6. Test-to-Test Performance Report: You will get a comparison report of your performance between Test 1 and Test 2. 7. Online Test: Since the tests will be conducted online, students can appear for it from their home or any other place they want. This will prepare you to face the actual exam with full confidence. 2. The tests will be conducted on an all India basis just like the actual JEE or NEET exam. Students from all across the country will take the tests. They will get their All India Rank for the respective exams. This will help you find out where exactly you are standing among all the students and what your chance is to get into your dream college. 3. Taking the Empower All India Test Series will give you a feel of the real exam. It will help you deal with the psychological pressure of taking a national-level test. d. Analysis of how effective your attempt strategy was, etc. Identifying your weaknesses before the actual exam will give you enough time to work on them and improve. As mentioned above, the test series include two tests for each of the two exams – JEE Main and NEET. The tests will be conducted at a gap of three months. Students can appear for any one or both the mock test series. Go to the official website of the Empower Mock Test Series: empower.thehindu.com. Click on “Register” from the top right corner. Enter your Personal Information, Address, and Academic Information in the respective fields. A One Time Password (OTP) will be sent via SMS on your mobile number. Enter it and click on “Proceed”. Enter name and contact details of your parents. Click on “Select Series” for the test you want to appear. You can select any one or both of them. Click on “Pay Now” and make payment of the fees. Upon registration, students will receive an exclusive Username and Password to access the test page. Note that a working mobile number and an email ID are mandatory for registration. The tests will be conducted on a common date for all students across the country. On the day of the test, students can take the test as per their convenience between 10 am to 6 pm. They can log in with their Username and Password from anywhere since this test series is online. Students can use either a computer, laptop, tablet or smartphone with internet access to take the test. The moment they start the test, the timer will start to measure the duration as per the respective exam. The test will be submitted automatically once the timelines are reached. Students can then check the detailed report and analysis on their performance and areas of improvement. The same reports will be also mailed to the students’ registered email ID. National and State level percentile score of the student will also be flashed in the same login page. 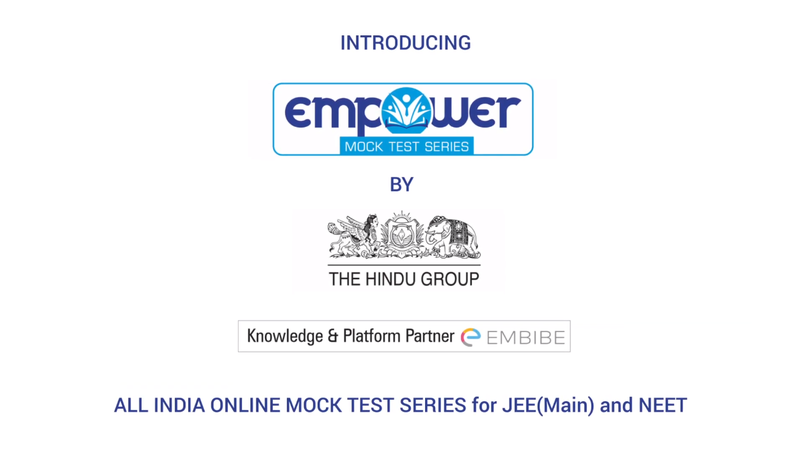 So, take your preparation to the next level with The Hindu Group’s Empower All India Mock Test Series. With Embibe’s data analytics, know your knowledge gaps and loopholes and behavioral and test-taking skills. Rectify them before appearing for the actual exam and guarantee a higher score. We hope this detailed article on All India Test Series For JEE Main and NEET helps you. Feel free to comment below if you have any query regarding the test series, and we will get back to you. May I know the details about fees? Hey Aryan, the registration fee for the exam is Rs 500. May I know the eligible criteria? Sonu, there is no eligibility criteria. You can take any of the tests or all three of them (JEE Main, JEE Advanced, NEET) if you are studying in Class 11 or 12 with PCM and/or PCB combination and are appearing for the exams. Please try once more. If it still doesn’t work, let us know here and we’ll help you. You will get personalised feedback that will identify your academic weaknesses and behavioural gaps such as time management, test taking strategy, etc. you will also get tips and tricks, quick solutions for revision, etc.